We are excited to announce that next year’s Ecuador Ecotour group will be returning for two nights to the unique Anaconda Lodge Ecuador. Located on Anaconda Island in the heart of the rainforest, the Anaconda Lodge Ecuador has much to offer. Anaconda Lodge is like nowhere else, not just based on its location – a half hour boat ride down the Napo River – but also its history and how it has integrated into the local community and supported the local people. We will tour a local village, have indigenous guides, and find a multitude of frogs on site. There is no more of an authentic stay within the Ecuadorian Amazon. 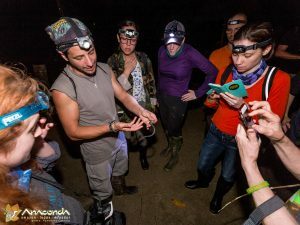 If we are lucky, we may even find the caecilians (a rarely seen, limbless amphibian that lives underground) — as our 2017 group did.